Who knew there were beautiful strands of "spaghetti" inside a squash! This recipe is extra easy because delicious turkey meatballs in tomato sauce and spaghetti squash are prepared at the same time together in the pressure cooker. You will love not only a quick, easy, and tasty dinner, but also a simple clean-up. In the end, you will wonder why you ever spent so much time boiling water to make traditional pasta! Preheat oven broiler. Line a baking sheet with parchment paper. Mix ground turkey, egg, bread crumbs, garlic, oregano, cumin, red pepper flakes, salt, and pepper together in a large bowl; shape into meatballs using 1½ tablespoons per meatball and arrange on prepared baking sheet. Cook under hot broiler until browned, 3 to 4 minutes. Pour tomato sauce into the steel pot of your pressure cooker. Lay spaghetti squash into the sauce. Arrange meatballs into the sauce around the squash. Seal lid on the pressure cooker, turn steam vent to Sealing, and cook on High Pressure for 15 minutes. Turn steam vent to Venting to Quick Release pressure. Carefully remove squash to a cutting board. Halve the squash lengthwise. Remove and discard seeds. Use a fork to rake strands of squash from the rind. Divide squash strands between plates; top with sauce and meatballs. Garnish with Parmesan cheese as desired. For a fun presentation, keep the shredded squash in the shell and serve the meatballs and sauce directly in the squash halves! This is sure to wow your guests! Per Serving: 467 calories; 23g fat; 32.7g carbohydrates; 36g protein; 169mg cholesterol; 1275mg sodium. 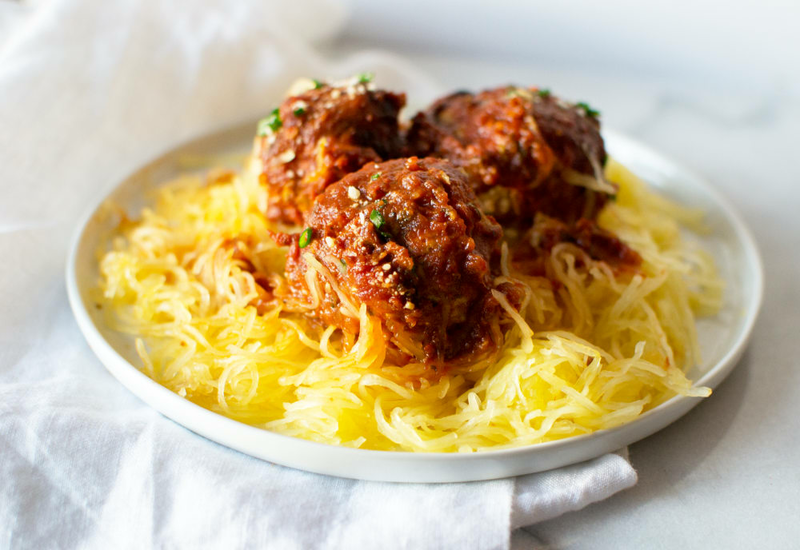 These turkey meatballs with spaghetti squash are fantastic! For years I've made my spaghetti squash in the oven, which takes quite a while. I love that this method uses a pressure cooker and allows me to cook the meatballs and squash at the same time. Talk about convenience! Also easiest cleanup of all time. Best recipe yet! I made this for the family the other night and it was super delicious! The kids even asked for seconds. The meatballs were also really delicious, I can't believe how easy this meal was to make in the pressure cooker at the same time. I'll probably never bake my spaghetti squash again. You may be able to sell your kids on "squash is like pasta" idea, but not mine. Their portions went in the compost. The meatballs disappeared in a hurry though! I actually had to think back to be sure I had used ground turkey. Not saying they were beef-like or anything, but they were very juicy and delicious. Maybe the best turkey meatballs I've made. that alone gets five stars & mommy and I can eat the squash. I tried this recipe but the squash came out way under cooked in the middle. Must have done something wrong but not sure what. It did not seem to get to pressure. The red button never did pop up as if under pressure. Ended up cooking the squash again. This was my first recipe I cooked in my new pot. This recipe was perfect. I used a small spaghetti squash so it fit perfect inside the pot and was cooked throughout, no problems. I had a 4 pound squash, 15 minutes was not enough time, the squash wasn’t tender at all. The meatballs were just okay, I’d definitely add more seasoning. I probably won’t be making this again. This was inexpensive , super fast and easy to make. My 3 and 6 year old gobbled it up. My husband asked "where did you get these meat balls"? Lol. I told him I made them and he said "Save that recipe. These are the best meatballs I've ever had. Pretty high compliment because normally he hates when I sub turkey for beef in my spaghetti sauce. I doubled up on the meatball part of the recipe to have some leftovers.